Back in September I mentioned that I had signed up for the Kalmbach Bead Soup Party and received a bead mix from the retail bead store Beauty and the Bead. This party was inspired by the amazingly talented Lori Anderson's new book Bead Soup. And now it's time for the reveals. 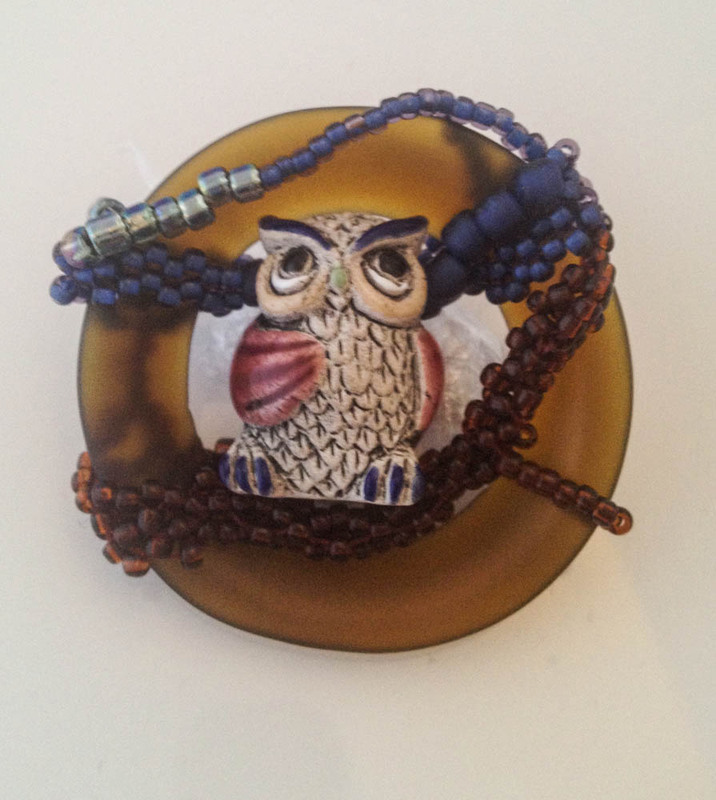 I ended up making two pieces with the mix, separating out the clasp and the owl focal. 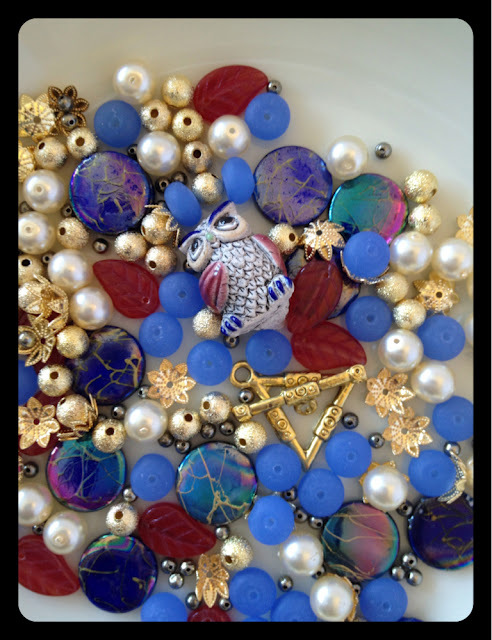 The pearls and bead caps seemed so formal, I decided to separate them out from the owl and include them with the gold triangular clasp. 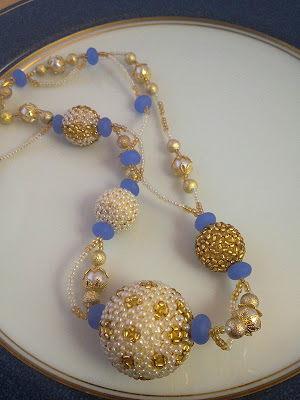 Not too surprisingly, I found myself creating beaded beads to round out the necklace. I think the blue frosted glass adds a bright touch. The owl was more difficult. The thread hole runs through his head, side to side, which made me feel like he'd been lobotomized, and I wanted to minimize that feeling in my design. So he needed an environment to live in. 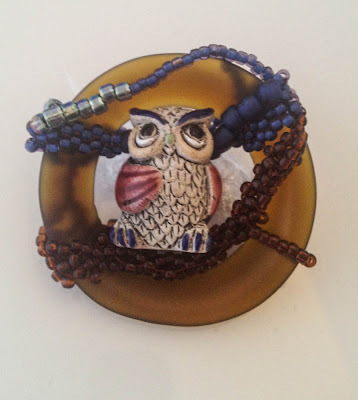 The solution came at Bead Fest, in the form of a tumbled glass ring by Kathy of Trinket Foundry. A freeform beaded branch and some 'sky' tie him into his environment. I think this will be a fun brooch to wear. I hate to say this because you may not have been going for this effect, but it is the one my eyes see: these seem so perfectly 1950's modern. I love both of them for that very reason. Neither piece is even close to being a replica, it is just the spirit that captured my heart. Actually, I'll take that as a compliment. I do admire many of the designs from the 40s and 50s - I love their clean, elegant lines. With the pearls and gold bead caps I felt like I needed to create something 'glamorous' and kept thinking of the type of jewelry my grandmother wore. With the owl brooch, I'd originally envisioned considerably more stitching, but it became a case of less is more. You did a fabulous job with them, what the heck- why not go with what you are good at. Those beaded beads are beautifully stitched AND your color composition is awesome with just the right balance. Both pieces are fantastic! I love the way you took a soup and turned it into pieces that reflect who you are. You made the soup YOUR style instead of letting it dictate. Way cool. Those are sweet & very easy to wear with any outfit. I like the beaded balls. And yep...looks like something I'd see my Grandma wear when she was going out to a political dinner. Karen, I always marvel at your beaded beads - that are spectacular! Really love your piece here! 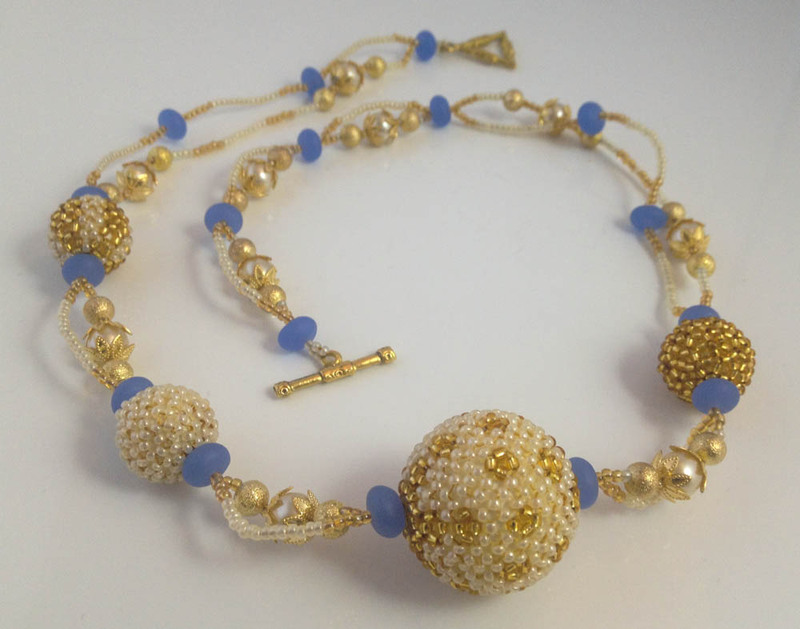 I would not think to put gold and blue together, but it is really stunning together - so rich! I was laughing about your lobotomized owl ... but he turned out great! You guys that can do free-form beading amaze me! Still not comfortable enough with straight up beading, let alone free-form! Absolutely stunning, Karen! Your beaded bead necklace is really classic-looking and so elegant. I like the details, such as how you strung the additional strand of beads throughout the beads as well. Such a beautiful piece.